Mothers prayers,and thoughts of Love: What's For Dinner? Imagine walking from village to village, town to town giving Godly advise to those who listened. After awhile a following continues with you town to town. Village to village. Most came to hear you, and see you out of curiosity. On one particular day you had taken the boat out to cross over to the next city and you noticed that thousands had gathered to hear you speak. As the boat approached the shore, your crew became a little worried. The hour was getting late and most had come from far far away. “Bring them here to me,” he said. And he directed the people to sit down on the grass. 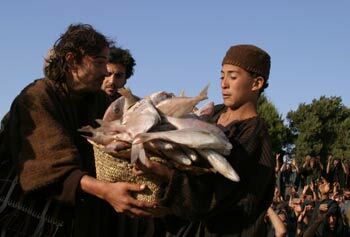 Taking the five loaves and the two fish and looking up to heaven, he gave thanks and broke the loaves. Then he gave them to the disciples, and the disciples gave them to the people. They all ate and were satisfied, and the disciples picked up twelve basketfuls of broken pieces that were left over. The number of those who ate was about five thousand men, women, and children. This passage reminds us of how man often thinks. Especially when tired, it has been a long day. Why should we do for them or him or her? Why don't they get their own? Why do they always want something from me? How am I suppose to help, I can't even help myself? Jesus proves that it is not about "I" it is about we, it is about charity, it is about kindness, it is about giving up self.